Earlier this month, I had the pleasure of attending the CBOE Risk Management Conference (RMC) in Bonita Springs, Florida. Now that the conference is over and the CBOE has posted most of the presentations, I thought I would take a little time and offer a retrospective look at some of the content that caught my attention. Before I do that, I am compelled to tip my cap to Russell Rhoads, whose indefatigable and prolific efforts were responsible for capturing many of the details of the conference. Russell’s posts and those of Matt Moran made it possible for anyone to have a virtual front-row seat throughout the proceedings. Their efforts in conjunction with the RMC are archived at the CBOE Options Hub with the CBOERMC tag. From my vantage point, I thought it particularly interesting that the two keynote speakers, Martin Zonis and Carl Tannenbaum, had such divergent views about the potential risks and rewards in the U.S. financial markets in the coming years. Zonis placed most of his attention on political risk and foreign policy matters and declared that the markets were “underestimating volatility in future years.” While Tannenbaum expressed concern about banks in Europe as well as credit and real estate in China, he had a much more sanguine view of the future of the U.S. economy and financial markets. Among the other presentations, I was particularly interested to hear Maneesh Deshpande provide an overview of the players and strategies used in volatility products during the course of the evolution of the VIX product platform. Deshpande described the VIX futures as a mature market, with liquidity and supply having shifted from commercial to con-commercial traders. He also indicated that demand for VIX puts has stagnated, while new entrants are increasing the demand for VIX calls. All of this has influenced how the VIX spikes and mean reverts, as well as how the VIX futures term structure has evolved. Another particularly interesting session involved Ed Tom and John-Mark Piampiano, who tackled the subject of the volatility of volatility, invoking the likes of VVIX as well as the third and fourth derivatives of SPX implied volatility. At every conference at least one session gives you things to mull over long after the speakers are done and for me, this was the session that hit the high notes. Ed Tom’s presentation has not yet been posted, but he started his talk by decomposing VIX risk premium into realized volatility plus skew plus kurtosis and went on from there. Sheldon Natenberg and Trevor Mottl were tasked with the subject of evaluating the volatility surface: skew and term structure. Not surprisingly, they were up to the task, with Mottl focusing on the role of money and credit in shaping the volatility surface. He indicated that the increasing size of the Fed’s balance sheet has depressed volatility across the board over the course of the past few years and expects that as the Fed’s balance sheet normalizes, the change in non-financial debt will become the most important influence on equity market volatility going forward. Mottl attributed the steepness of the VIX futures term structure to the uncertainty related to the Fed’s ability to be successful with its quantitative easing program. He also traced fluctuations in the skew of volatility to expectations related to the Fed’s tapering plans. For those who may be interested, the 3rd Annual CBOE RMC will be held September 3-5, just south of Dublin, Ireland. Since all of my ancestors trace their roots back to Ireland, I can’t imagine a better place to hear about the latest thinking in volatility and ponder the miracle of Guinness draught at the same time. While I have a long way to go before I become the next Manny Mota, yesterday I was delighted to be able to pinch hit for Steve Sears of Barron’s for the twelfth time, when I penned Emerging Market Stocks: Have They Hit Bottom? as a guest columnist for The Striking Price. In the Barron’s article I talk about how rapidly increasing uncertainty and risk in emerging markets during January was largely responsible for the 31.7% VIX spike on January 24, but was nowhere near the levels of June 2013, at least as measured by the CBOE Emerging Markets Volatility Index (VXEEM). I also used the VXEEM:VIX ratio and some other data to support the idea that emerging markets have likely bottomed and are poised for a bounce. I concluded the Barron’s column with a couple of options trade ideas to take advantage of a reversal in emerging markets. 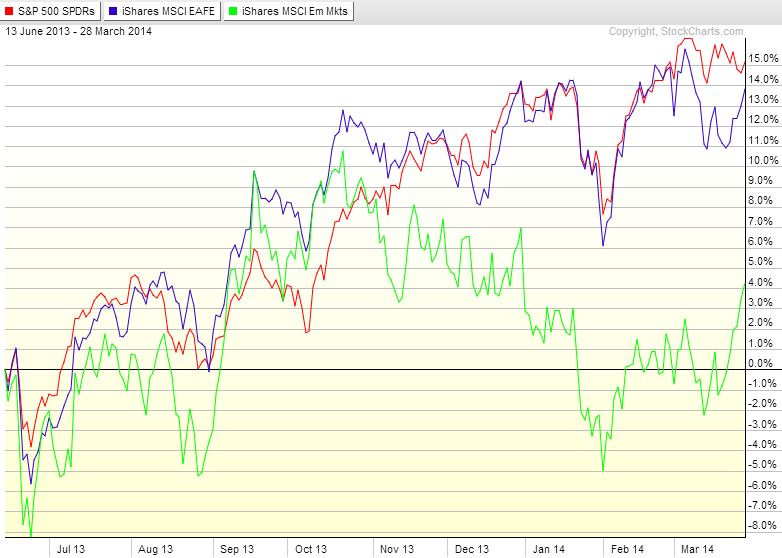 When I wrote the article, on Tuesday, my position on emerging markets was very much a case of going out on limb. By Friday’s publication date, which includes Tuesday’s option pricing data, emerging markets had already experienced a significant bounce and my emerging markets thesis no doubt sounded much less provocative than it would have three days earlier. In any event, I strongly believe that emerging markets (EEM) and VXEEM bear close watching going forward, as the Fed moves toward a new policy direction, emerging markets grapple with rising interest rates in the U.S. and the global economic growth story has many critical ripple effects across the full emerging markets landscape. BRIC Update: China a Leader or an Outlier? Today was the first full day of the CBOE Risk Management Conference and between the presentations, sidebar conversations and opportunities to meet and greet, I have to say that things hit full stride very quickly. Today CBOE CEO Ed Tilly announced that the CBOE will roll out nearly 24 hours of trading, five days per week in VIX futures beginning on Sunday, June 22. 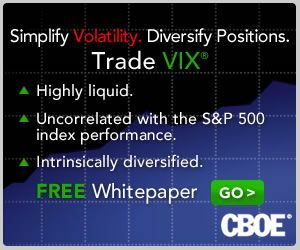 This announcement follows another important announcement last week that options on VXST (the CBOE Short-Term Volatility Index) will commence on April 10. Clearly, things continue to move forward on the volatility product front and at the end of the year, I suspect we will lock back on these two developments as critical milestones in the volatility space. Another featured speaker was Maneesh Deshpande, who talked extensively about the evolution of the demand for volatility products as well as the evolution of the supply for volatility products. Maneesh had a number of interesting observations about new players and new strategies in the volatility space. He also expressed concern about the crowded VIX short trade and the potential for the next crisis that does not mean-revert quickly to lead to a sharp second VIX spike as shorts scramble to cover their positions. Last but not least, I had the opportunity to meet quite a few people who have been regular readers of VIX and More over the years, many of whom nudged me to ramp up my posting frequency – which I certainly intend to do in 2014, starting this week. Just a quick reminder for those who may not be aware of it that the VIX futures and options expiration for March falls on next Tuesday, March 18th, not the typical Wednesday. This means that the VIX special opening quotation (SOQ) used to determine the March settlement price will be at the open on Tuesday and also the last trading day for the VIX March futures and options will be on Monday. With the speed at which things are developing in Ukraine and elsewhere, these 24 hours could turn out to be significant. For those who are interested in a link to the VIX options expiration calendar, the CBOE maintains a 2014 options expiration calendar here, with the VIX expiration highlighted in a solid dark orange box. Note that I have a link to the CBOE options expiration calendar on the blog at the bottom of my VIX, Sentiment & Options section. To review how the VIX expiration dates are determined, the VIX futures and options expire 30 days before the SPX monthly options expiration in the following month. These SPX options expirations are almost always on a Friday, therefore the VIX expiration is almost always on the Wednesday four weeks and two days prior to the SPX expiration. The complication factor for the VIX March 2014 expiration cycle is that on Friday, April 18, the CBOE is closed due to the Good Friday holiday, which pushes up the April SPX expiration to Thursday, April 17, with the result that the VIX March expiration is pushed up one day as well. Last but not least, the VIX SOQ probably deserves a separate post in order to explain some of its unique characteristics, but it is worth noting that the VIX SOQ is not the price at which the VIX opens, but rather another separate calculation that takes place at the open. The CBOE calls it the CBOE Risk Management Conference and I like to think of it as “The VIX Summit,” but by any name I am convinced that the 30th annual CBOE RMC (yes, it is even nine years older than the VIX) is the top conference of the year for anyone with an interest in the VIX, volatility and more broadly in the subject of risk management. The Shifting Landscape of Volatility Products: Who is Doing What and Why, and What Should You Do About It? Panel on Volatility as an Asset Class: What Options- and Volatility-Related Strategies are Institutional Investors Employing and Why? I encourage anyone with an interest in volatility to attend as this is an excellent place to find ideas to ruminate on and to master the art of volatility cross-pollination. After all, it is still a relatively small (but growing) group of aficionados that live and breathe volatility. Where else, for instance, can you find a bunch of like-minded souls who are already plotting how to implement VXST options strategies when these products have not even been launched? Speaking of like-minded souls, if you have a moment, I encourage you to flag me down and say hello. For those who are unable to attend, I will do my best to pass along some of the highlights from the conference. Finally, for those who might be interested in a similar event on European soil, planning for the 3rd Annual CBOE RME-Europe is ongoing and at this juncture the odds favor a location that will appeal to those who are fans of links golf courses.